From left, board chair Patrick Halladay, Superintendent Howard Smith and Alan Matson before the vote on the 2016 budget. The school board approved a $68.6 million budget for the 2016 fiscal year, which is 1.75 percent higher than the current year's spending plan. The increase in the tax rate — which might change when the state rate is finalized — would be roughly 2.4 percent. The final decision rests with Burlington residents, who will vote on it on March 3. Interim Superintendent Howard Smith, who started the job in late November, proposed a budget with a 2 percent increase and, at the request of the finance committee, an alternate version with a 1.5 percent increase. 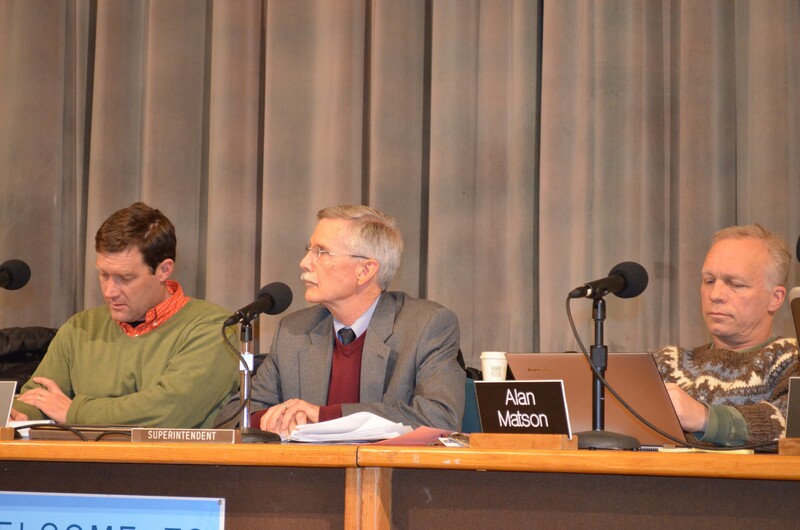 At the start of Tuesday's meeting, finance chair Miriam Stoll suggested a middle way: a 1.75 percent increase. Stoll's attempt at compromise worked — winning approval from nine members — but only after a prolonged debate. Commissioners said they remained conflicted — reluctant to ask fed-up taxpayers to again stomach an increase but hesitant to accept cuts contained within all three proposals. A number of them read from extended remarks, prepared ahead of time. Three hours into the meeting, Smith urged the board to make a decision. "Let's just acknowledge what [this debate] is. It's about symbolism, not money." The 2016 budget proposal that Smith originally proposed included some position cuts and froze spending in materials, supplies and some programs. Among other changes, the superintendent recommended increasing some class sizes and eliminating some paraprofessional, social worker and special education positions as part of a reorganization of those services. Last year, after striking down the original budget proposal, voters narrowly approved a budget with a 7 percent tax hike. The school board and members of the school administration have spent the past year working to remedy repeated deficits and to put in place more financial controls. In 2015, the district is on pace to incur another deficit of $1.3 million, but Smith said he intends to use spending freezes and unexpected revenue to erase the deficit before the fiscal year's end. Though only two months into the job, the interim superintendent has won praise from the school board, city councilors and Mayor Miro Weinberger for putting forward a reasonable budget proposal. "I may be one of the few people in Burlington who is actually quite excited about this budget," Stoll said. "We made some mistakes but we’ve made some tremendous changes and right now we do have a sense of where we spend our money."